This article was first published in the East Asia Forum. Despite years of reasonable economic growth, 19.4 million Indonesians are still unable to meet their daily dietary needs. 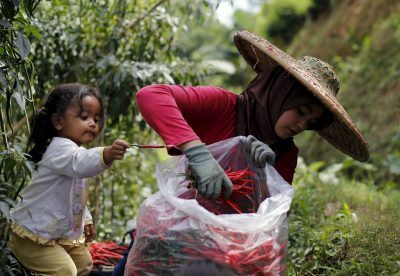 The 2017 Global Food Security Index ranks Indonesia 69th out of 113 countries, and its overall score (which is independent of relative country rankings) has barely increased over the past five years. The continuity and severity of this problem indicate that Indonesia is facing chronic food insecurity. The Indonesian government has aimed to address this problem by increasing supply through increasing rice production and developing higher-value crops, but these strategies have proven ineffective. The government’s focus on national food supplies mimics an outdated understanding of food security as meaning only the domestic availability and the stability of food supplies. Since the mid-1990s, the UN’s Food and Agriculture Organization has added individuals’ access (the affordability of food and individual food preferences) and utilisation (food safety and nutritional benefit) to what constitutes real food security. These two dimensions reflect the demand side of food security, and it is demand-side measures that the Indonesian government has neglected in trying to guarantee food security. This conception of food security suggests that an immediate solution to the problem is to increase competition in domestic food markets. Competition leads to technological progress, improvements in food quality and price reductions. Indonesian food markets remain highly concentrated and there have been several investigations by the national anti-monopoly authority of monopoly power in food markets. Competition in domestic food markets and increasing food availability of food supplies recommend opening food markets up to cheaper imports. Indonesia’s political leadership largely ignores the importance of imports for food security, incorrectly believing that that food insecurity comes from dependence on food imports. A number of Indonesian laws stipulate that imports are only permissible when domestic supplies are ‘insufficient’. No national government has ever managed to plan production and consumption accurately for the whole country — let alone a country with an enormous population like that of Indonesia. The government’s insistence on controlling market supplies leads to serious problems with the cost of food, its quality and availability. For starters, in Indonesia different ministries have different ideas about food statistics. The Ministry of Agriculture disagrees with Statistics Indonesia on the total harvested area of rice paddies. The Ministry of Maritime Affairs and Fisheries disagrees with the Ministry of Industry on the necessary amount of salt imports. Several agencies have different numbers for the annual per capita consumption of rice. With these data discrepancies, central coordination of food supplies is impossible. When domestic prices soar and the government finally allows food imports into the country, importers have to go through a complex licensing process that involves several government authorities. Delays caused by this process have resulted in losses of 303 billion Indonesian rupiah (US$22 million) for Indonesian taxpayers since 2010. In addition, the government’s influence in the process opens opportunities for rent-seeking behaviour and corruption. Indonesian prices for beef, rice and several other commodities have soared above international market prices. Retail food prices are often much higher in Indonesia than in neighbouring and much richer countries. These price premiums ‘taxed’ Indonesian consumers approximately US$98 billion between 2013 and 2015 — well above the cost even of the EU Common Agricultural Policy levies on European consumers. The tragedy is that, despite the highly inflated food prices paid by Indonesian consumers, farmers do not benefit from this self-sufficiency policy. Two-thirds of Indonesian farmers are net consumers of food and therefore suffer from inflated food prices themselves. Low farming revenues result in low household incomes — small-scale farmers holding less than 0.25 hectares of land in Central Java earn just 500,000 rupiah (US$36.35) per person per month. The self-sufficiency policy is meant to protect farmers, but it is the middlemen, rice millers and wholesalers who reap the largest benefits from it. The food self-sufficiency policy is supposed to shield Indonesia from extreme international food price volatility. Global rice prices soared by more than 100 per cent in 2007–08, whereas Indonesian rice prices remained relatively stable. But the stability was costly and short-lived. Indonesia actually imported 1 million tons of rice in 2007 — five times the annual average of the preceding three years. And domestic prices jumped dramatically again in December 2009 when world prices subsided. By the end of 2012, Indonesia’s rice price was 65 per cent above the international price, which threw millions of people into poverty. International rice price spikes are only one of many risks to Indonesian food security. Macroeconomic crises, insect and plant diseases, and natural disasters all impact on the level of undernourishment in Indonesia, and these can’t be fixed by domestic supply-side measures. The government’s food policy may temporarily protect Indonesians from food insecurity in times of international food price spikes. But in doing so, it creates serious problems and contributes to chronic food insecurity among Indonesia’s poor. Removing all trade barriers (especially the import bans) might be politically difficult for President Joko Widodo. But gradual reform is possible. Only such reforms are going to permit Indonesia to feed its people and achieve genuine food security. Rainer Heufers is the Executive Director of the Center for Indonesian Policy Studies (CIPS). Arianto A Patunru is a Fellow in the Arndt-Corden Department of Economics and the Indonesia Project in the Crawford School of Public Policy at the Australian National University.